The Scoop: Stef Safran is a hands-on matchmaker dedicated to helping singles find love in the modern age. She founded Stef and the City in Chicago to support and advise men and women who want to be in a relationship yet can’t seem to get a handle on dating. In addition to arranging dates, Stef coaches her clients on how to become more confident and capable daters both offline and online. In the last year, Stef has adapted to the fast-changing dating scene by offering online dating assistance to clients seeking quality dates. 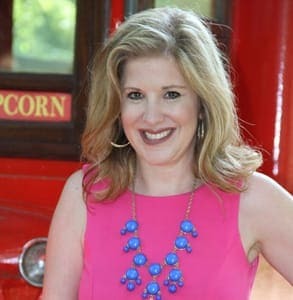 When a well-educated single man named John showed up at Stef Safran’s matchmaking office, she felt sure that she could help him meet someone special. He wasn’t so confident. He had tried matchmaking once before and hadn’t had any luck. His bad experience made him leery of trusting another dating professional with his love life. Stef and the City is a traditional matchmaking company founded by Chicago dating expert Stef Safran. However, Stef’s caring manner soon won him over. She listened to his problems and gave him practical dating advice based on her experience as CEO of Stef and the City, a Chicago-based matchmaking firm. To start with, Stef advised John to stop setting up dates at local bars — he wasn’t a big drinker, so why would he choose an environment that made him uncomfortable? She encouraged him to stay in his comfort zone, at least the outset of the relationship, and build relationships with women who shared his interests. Today, John is happily married with a young son. Even though Stef didn’t introduce the couple, John told her her advice helped him get in a committed relationship. Her support got him in the right mindset to meet and marry the one for him. Throughout her career, Stef has consulted with single men and women facing all sorts of dating challenges. Her level-headed guidance and savvy introductions have led many singles, like John, to meet their match in Chicago’s city limits. Stef’s clients are singles as young as their mid 20s and as old as their mid 50s. With the swiping culture, it’s harder to find someone, but it’s also harder to understand how to date in an age of The Bigger Better Deal is just around the corner. They’ve tried dating on their own — they may have already been married, or they just know what they are doing isn’t working and are sick of meeting the wrong people. They’re ready to get off the carousel of bad dates and settle down with a serious partner. The trick is finding that person. Professional matchmakers can help singles get clear about what they want and meet the right type of people, but that may not be enough to make a relationship work. Singles have to be willing to change their bad dating habits if they want to change their bad dating results. Stef can identify her clients’ dating issues and suggest remedies. Whether she’s recommending an attitude adjustment or a personal stylist, Stef gives singles the resources to improve themselves and overcome obstacles on the way to love. 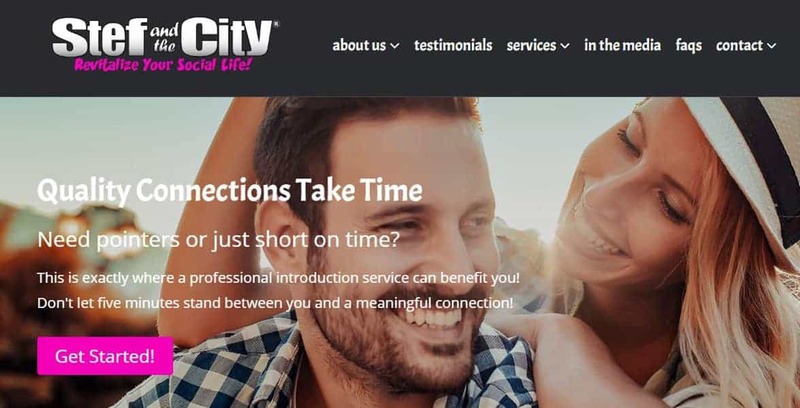 Stef and the City offers matchmaking, coaching, and other dating services to assist serious singles. Stef and the City’s traditional matchmaking and coaching services give singles a primer on choosing a partner and getting in a relationship. But some singles need a little extra help along the way. That’s why Stef offers additional services to get daters up to snuff and ready to knock the next date out of the park. The clients who take Stef’s feedback to heart and work on themselves often see their dating patterns change for the better. Stef can do her part as a matchmaker and dating coach, but she needs her clients to do their part as well. We’d all love it if matchmakers could wave a magic wand and make your one-true love materialize out of thin air. But it doesn’t work that way. Some singles mistake matchmakers for miracle workers and don’t understand that building a relationship takes much more than an introduction. Singles need to be willing to put in the effort to turn a date into something real and lasting. Stef told us the most difficult part of her job often isn’t finding dates, it’s ensuring her clients set reasonable standards for themselves and their dates. She advises her clients to set realistic expectations in the dating scene and not hold out for an imaginary perfect match. It doesn’t have to be can’t-eat, can’t-sleep love at first sight. A great first date doesn’t have to involve fireworks and candlelight. A long conversation at a coffee shop could be just as enjoyable and promising. Stef encourages singles to look beyond the fairy tale and create a relationship that’s grounded in reality, honesty, and mutual attraction. Dating can be a long and tedious process, but Stef is there to support her clients and see to it that they never give up hope. Her central message is for singles to let go of their false beliefs and unrealistic expectations and just try to have fun meeting new people. According to Stef, when you go into it with a positive frame of mind, you automatically become more attractive and engaging on dates. Stef expanded her business to include online dating profile help because she saw singles struggling to master these high-tech tools and wanted to lend a hand. She teaches clients how to market themselves on a dating site and stand out from the crowd in their profiles and messages. Her online dating strategy focuses on using authentic and original content to draw serious date prospects. This coaching program helps singles maximize their time on a dating site (or app) and get the most out of the experience. Stef teaches her clients how to sort through their date prospects online in a smart and efficient way. It’s important to have a real conversation, she told us, before agreeing to a date with just anybody. Her step-by-step assistance keeps clients safe from scammers and brings common courtesy back to the modern dating scene. The many frustrations and heartaches in the dating scene are enough to get anyone down. John was at his lowest low when he turned to Stef and the City for help. Stef gave him the sensible advice he needed to turn things around and put his best foot forward on every first date. Now his dating days are finally behind him, and he has a young family to call his own. Though Stef didn’t introduce John to his wife, the Chicago matchmaker give him the confidence and dating strategies to get the relationship he wanted. Stef’s job isn’t simply to introduce singles — it’s to prepare them to make a good impression and succeed in the modern dating world. She gives them tips and tools they can use on their own, so nothing stands between them and a new love interest. Stef’s matchmaking and coaching services have made a difference in countless lives, and she hopes to continue sharing her insights with singles across the country.